Well, it has been a fun holiday season filled with lots of family and leisure time. Now that both children are back in school (granted Will is in school three days a week for long enough for me to workout, shower and maybe get groceries) I am getting my sewing mojo back. 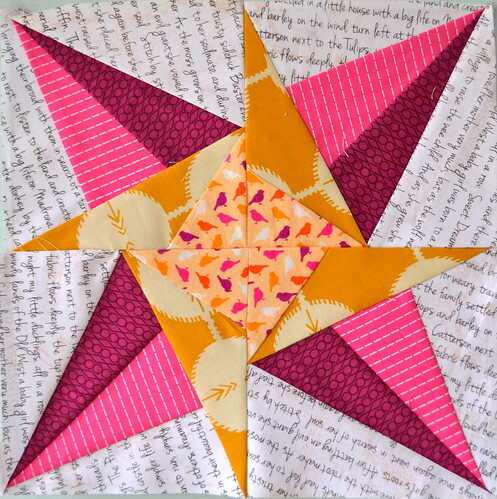 I made my first Lucky Stars block of the month block. I like the colors but I am really not sure where I am going from here. Probably not these colors on every block, but now I have to figure out what else goes well with them. In case you are wondering the background text fabric is Madrona Road Memoir. For the star I used the Running Stitch in pink from Patty Young, Lizzy House Jewels in purple, the mustard one is from AMH's Field Study. Those birds are from a yard of Park Slope I bought a few years ago that has gone a long way and appeared in many projects! I also managed to get addicted to the Scrappy Trip Around the World QAL that has spread like wildfire through instagram and flickr. My instagram name is courtiepie and this QAL is #scrappytripalong. You can see the flickr group here and the tutorial here. Warning: this is very addictive and I may get nothing else done in the foreseeable future. As I do other things, I've been cutting the 16x2.5" fabric strips from every piece of fabric I use or that catches my eye. 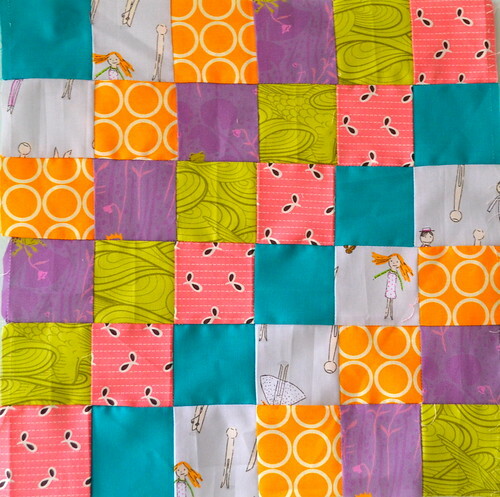 I have no idea where this quilt is going, I just figure I'll make blocks every time I manage to accumulate a group of six strips that I like together. 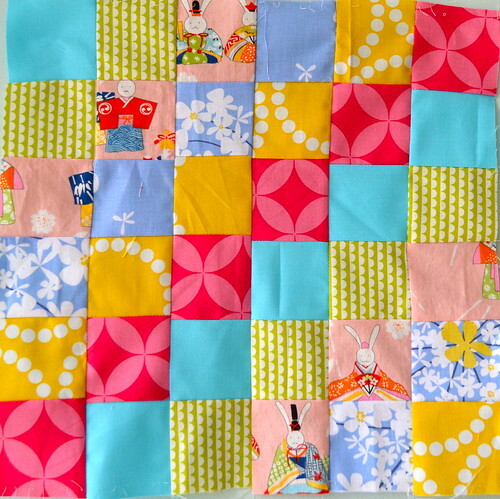 You can use four blocks to make a big, 24" pillow, nine blocks to make a baby quilt, etc. I like it for the I spy fabric-aholic edition I can play. Instead of "I spy an airplane" it is like "I Lizzy House Pearl Bracelets in yellow." We'll see if the infatuation can carry me through to an actual finish. Next on the list, finally getting started on my Sew Sew Modern swap and finishing up a few WIPs that have been in progress for an embarrassingly long time! Oh dear...I fear my scrap basket(s)...It(they) may swallow me whole with all the many scraps it(they) contain! There's a goal for '13...conquer the scrap basket! I love the block AND that you are tripping with us! love the bright colors! happy new year!